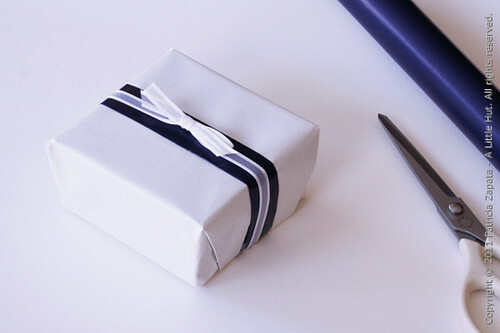 I know what I'm about to say is something of a no-no to some people, but the truth of the matter is that I don't really enjoy gift wrapping as much as I should—or I think I should. It is a paper related activity after all... But, umm no. It doesn't really quite qualify as the most exhilarating of activities for me. Having said that, I do like showing up with something decent looking and that at least looks like I put some effort into it. Over the weekend I needed to wrap a baby shower gift and I decided to take advantage of the fact that the 'wrong' side of the paper was white. Instead of hiding it, I made it the main feature. The idea is really simple and one that can be used if you're either short on wide ribbon or extra colored strips of paper to achieve the same effect. 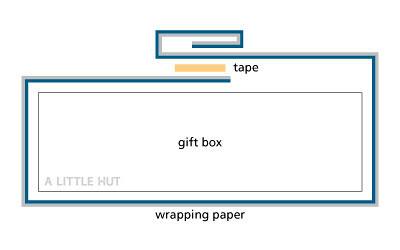 All you have to do is wrap the paper as shown in the side-view graphic below. Fold over the colored side/patterned side of the paper twice towards the 'wrong' side of the paper. 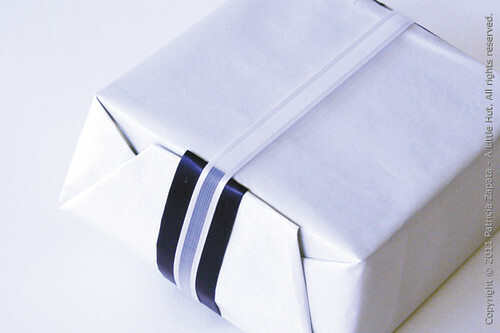 Wrap the gift with the wrong side of the paper facing out and tuck the opposite end under the folded edge. Attach all paper (top and sides) with double-sided tape or a little roll of regular tape (sticky side out). I added a ribbon to give it a final touch. Technically I didn't use double-sided paper, but if you happen to have some, all you need to do is decide which pattern you'd like to be dominant (the white) and which to be the accent (the dark blue) and fold accordingly.